Figuratively Speaking! : Back with a Cycle! Hey everyone! In my previous post I gave you all my word to come back sooner and I'm a woman of my word. Literally. If you haven't read it yet, it's titled - "Hello Tu Kaun Jahan Se Aayee." (Just making sure you hit the right one) By the way, you haven't missed out much. Read it if you like to listen to sweet nothings of a lost - in - her - own - world #writer who likes to drift more often than not especially on this space. That was the whole idea of creating it in the first place, anyway. However, this time I have a definite purpose. 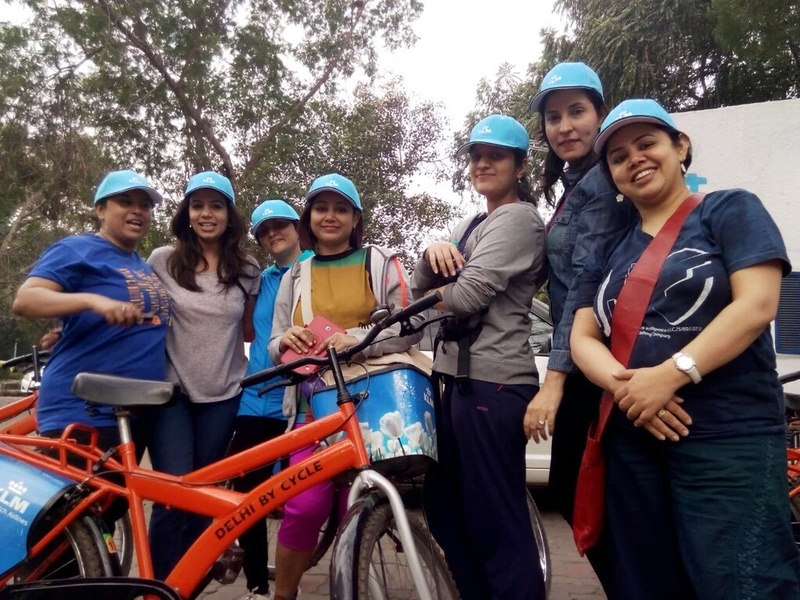 I want to share this beautiful and unique experience I completely savoured kind courtesy #KLM Royal Dutch Airlines and their bright idea to treat 7 lucky women on the occasion of Women's Day with a cycle ride of the city! 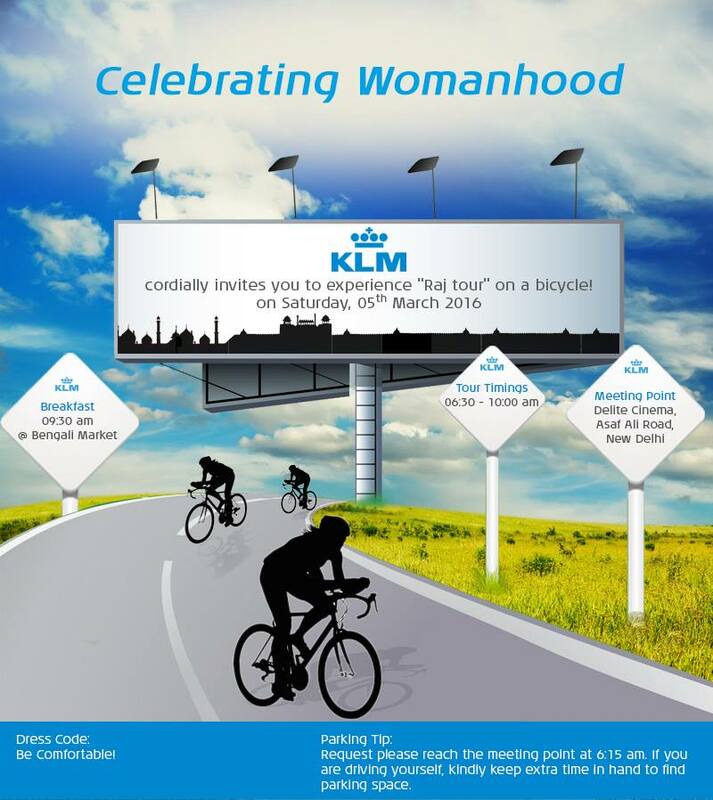 They deserve a huge round of applause for such an innovative approach to celebrate Womanhood! KLM did it in association with #DelhiByCycle. And guess what? The company is owned by a Dutch journalist who decided to explore the city by cycle himself first and then hit on this lovely idea of sharing the experience with interested people; travellers, tourists, researchers, heavy weights, curious women and the likes by starting his own company. Rest is History of Delhi. To be discovered on a Cycle! 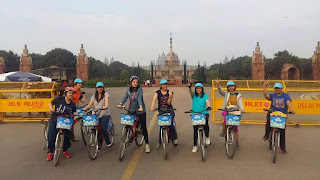 Anyway, what is great is that I got an opportunity too to go biking with six (actually seven others, if you count our Hindi - speaking, Chola Bhatura - relishing, Italian guide Elena. 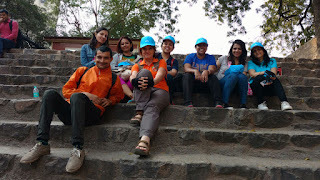 And we had a co - guide too. A very helpful one at that - Kapil) fun loving, daring and positive minded ladies from diverse fields. Let's see, we had an entrepreneur, a teacher, an Infrastructure consultant, a couple of travel professionals, An HR lady and me of course - the writer. You think there's no dare involved in cycling? Then consider this. Have been working late night...some as late as 12:30 p.m. Still you wake up at 5:00 a.m. so that you can reach the venue on time i.e. 6:15 a.m.
by hook or by crook. meaning you hail a cab and trust it will arrive on the given pick - up time ( two of the ladies reported their cab companies ditched them), or drive yourself, or coax your dear husband to drop you from one end to the other in the wee hours of the morning. And then from just a dare or a self - challenge it turned into an experience that would be imprinted in our minds for a long time. Our very sweet but very firm Instructor, Elena informed us that we will have to cycle approx. about 16 Kms. and time management was crucial to avoid heavy traffic. It's perpetually a rush hour after 7:00 a.m. in Delhi anyway. 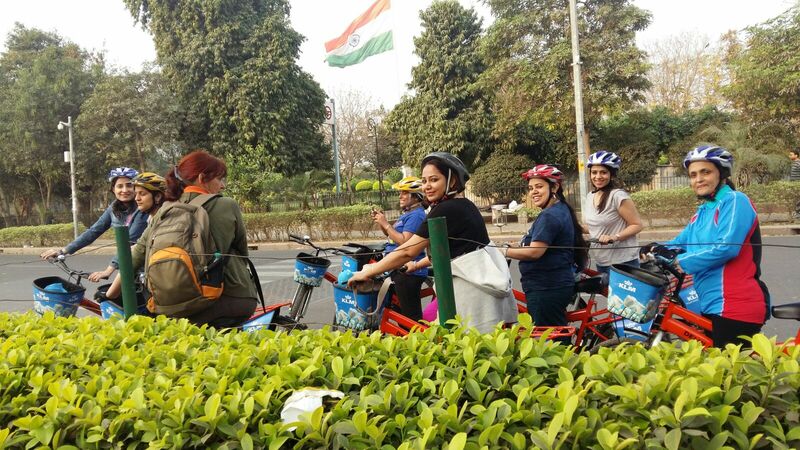 And our ride involved crossing narrowest lanes of Paharganj, Ajmeri Gate a glimpse of G.B Road before moving towards Connaught Place Inner circle, an uphill ride towards Rashtrapati Bhawan (which was a task) continuing towards Agrasen ki Baoli and then stopping for much needed Breakfast! at the popular Bengali Sweets in Bengali Market and then back to Asaf Ali Road, another uphill ride via an overhead bridge (can't recollect the name) this time with our tummies full. What a ride it was! Through it all not only did we look at our city through new eyes and admired its resilience, beauty and gumption to move on despite facing many odds but I also realised how warm and kind people are generally: There were at least three instances when I was filled with gratitude towards those strangers who voluntarily went out of their way to see we ladies crossed the roads and by lanes safely . One man at one of the red lights near Paharganj, tried stopping a bus coming from the other direction in order to let us pass, another halted a rickshaw waala in a narrow lane almost rebuked for not stopping and giving way when he saw us - ladies trying to make our way through that very narrow lane. Even the cops near Raisina Hill guided us to a safe spot from where we could smoothly take a right turn on the very busy road. Delhi filled me with pride that day. And I can't thank KLM enough for showing me this beautiful side of my beautiful city which I always believed, existed. The only thing I did not enjoy so much was the filth and unhygienic conditions people are living in still (esp in Old Delhi area) and despite the call for Swatch Bharat by our PM...we have a long way to go before we achieve this goal. I could go on writing but I think I better stop here...other things to take care of...plus I think you will only know and believe the above to be true if you go cycling around town yourself. and I will say, Go for it! It's worth it. And you do deserve it too. 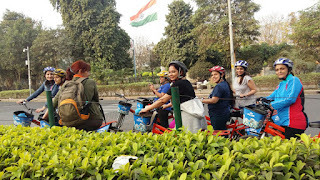 To see a different side of Delhi in order to appreciate it and connect with it.